Francis Fukuyama has 3 media appearances. Francis Fukuyama discusses The End of History and the Last Man. Tuesday, November 11, 7:30 p.m. Political order and political decay is the completion of the most important work of political thought in at least a generation. Compared to such seminal thinkers as Jean-Jacques Rosseau, John Locke, John Rawls, and Amartya Sen, Fukuyama boldly reckons with the future of democracy in the face of entrenched political paralysis in the West. Fukuyama argues that economic growth produces middle classes that in turn demand accountable institutions, the kind that make democracies healthy. But powerful elites can end up controlling those very levers of democracy, leading to the political paralysis evident in some Western societies. 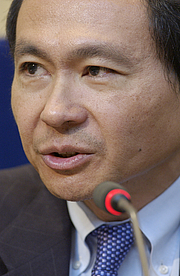 Join the conversation today by submitting your questions for Fukuyama through Google Moderator. The site will be active through November 11th -- you'll be able to view other questions and vote up/down for the questions you want to see asked during the live event. You can check back in at any time. Broken into sections on "The State", "Foreign Institution", "Democracy", and "Political Decay", Fukuyama gives an account of how state, law, and democracy developed over the last two centuries; how they interacted with one another and with the other economic and social dimensions of development; and, finally, how they have shown signs of decay in the United States and in other developed democracies. Political order and political decay has been called the companion volume to Fukuyama's The Origins of Political Order. Fukuyama writes with intelligence, eloquence, and erudition, making for an enjoyable read and a painless study. Francis Fukuyama is the Olivier Nomellini Senior Fellow at Stanford's Freeman Spogli Institute for International Studies. He was a researcher at the RAND Corporation and served as the deputy director for the State Department's policy planning staff. Chicago-born Stanford University professor Fukuyama speaks about his new book, a sequel to his influential Origins of Political Order. This new work takes up the essential question of how societies develop strong, impersonal, and accountable political institutions, following the story from the French Revolution to the so-called Arab Spring and the deep dysfunctions of contemporary American politics. Francis Fukuyama is currently considered a "single author." If one or more works are by a distinct, homonymous authors, go ahead and split the author. Francis Fukuyama is composed of 14 names. You can examine and separate out names.